There are thousands more sheep than people in Swaledale. The head of Swaledale is the home of the breed and all the farmers up here, including ourselves, keep purebred flocks. The Swaledale is hardy and strong and bred to live outside on the open fell. Both the male and the female have horns. The photo above is of a female Swaledale sheep. 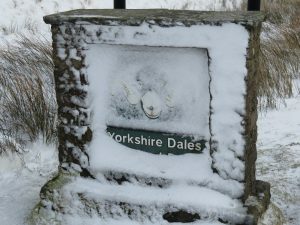 The Swaledale tup (a male sheep) with its large curled horns is the emblem of the Yorkshire Dales National Park.